Donna woke up about 4 and with the moon so bright woke Don to see if he would want to hike in the moon light. He agreed and we left camp about 5. It seemed like we were getting light from the stars as well. The trail was mostly easy to follow, but occasionally we did some backtracking to make sure we were on the right trail. At one point we saw car lights in the distance. As we got closer we saw a hunting camp set up. The hunters were making breakfast and waiting for it to get lighter. One of the men said that they had been coming here for 20 years and had always given water to the PCT hikers. We took some, wishing later that we had taken more. The trail is a lot of up and down. The cows are out and about, ringing their bells. Soon we are relieved to see a sign pointing to Bear Dog Spring. In the data book of water sources, this spring is said to always be dependable. Not this Year! The spring had gone underground and the water was no where to be found, except for a few stagnant pools. We took an inventory of our water, and looked at the map. Next water is 5 miles away, not bad and for sure doable. We did not have water stress yet. We are in the land of steep mountains and valleys. Rumor has it that this is the land of Bigfoot. Bigfoot could hide out here and not be found for many a year. Finally the trail crosses a road and the information says that we will find water about 100 yds down the trail. Don hikes down and comes back with gloomy news. He found the pipe, but instead of water flowing, it is barely dripping. A drop every 5 seconds to be exact. If we stayed here for an hour we might get a cup. Our water bladders each have less than a liter. So we are not desperate, but do not feel good about totally quenching our thirst. There is a spring on the map called Bee's Spring but the water data book has no information about this source. We begin hiking a long uphill section in the direct sunlight, not ideal when one is thirsty. I play the game of take water in your mouth, and swishing it around before swallowing. I even count my steps and take a swallow after every so many. In a little over an hour we see the sign to Bee"s Spring. There is a little flow coming down the hill, we should be able to get some water. Then Don notices a small pool below the trail. Out comes the dipper cup and we are able to drink as much as we want. We fill our bottles and just like that, our water stress is gone. We check our map and go over some options. One of which is to see where we are at 4 and call Jeff. At four, we are near Devil’s Peak and are able to use the satellite phone to call Jeff. He is a bit surprised at our request to be picked up, because the original plan was to get picked up in two days. He looks at Map Quest and figures that it is about a 3 hour drive. Glad that it is Friday night and he does not have any plans. From the guide book it seems that where the trail intersects the highway there is a large parking lot. We tell Jeff that we will be there or wait for us there. Okay we have just gotten roadheaditis. The pace quickens and we start heading down a 4000 foot drop. In the beginning the trail goes mostly down hill with little switch backs. As the clock turns to 6 we see Seiad Valley and the Klamath River. We are encouraged and think that we will get there before dark. Wrong, as the terrain lessens in steepness the switchbacks become longer, much longer! The river seems to be staying the same distance away. A beautiful, but poisonous plant hugs the trail on both sides. The red color and shape of poison oak gives us pause as we stay in the middle of the trail. Looks like we will be putting in a 14 hour hiking day. Every time we get a hint of the trail being close to the road, it just keeps going. Finally out of necessity, I get out my head lamp to see the trail and avoid poison oak. Unbelievable but the road appears, but not a parking area. In fact we do not even see a sign marking the PCT trail. We are at a driveway and it is pitch dark. Cars are few and far between. Don has very little light left, so when I see a car I wave my light. No car slows; they just keep moving on. About 8 here comes a smaller car and when I give it the light wave it slows then stops. It is Jeff! Our prayers were answered! If we had been later or Jeff earlier we probably would not have made an easy connection. It was not until driving back to Klamath Falls that we realize how far Jeff had to come to pick us up. It was over a 3 hour drive back to his house. 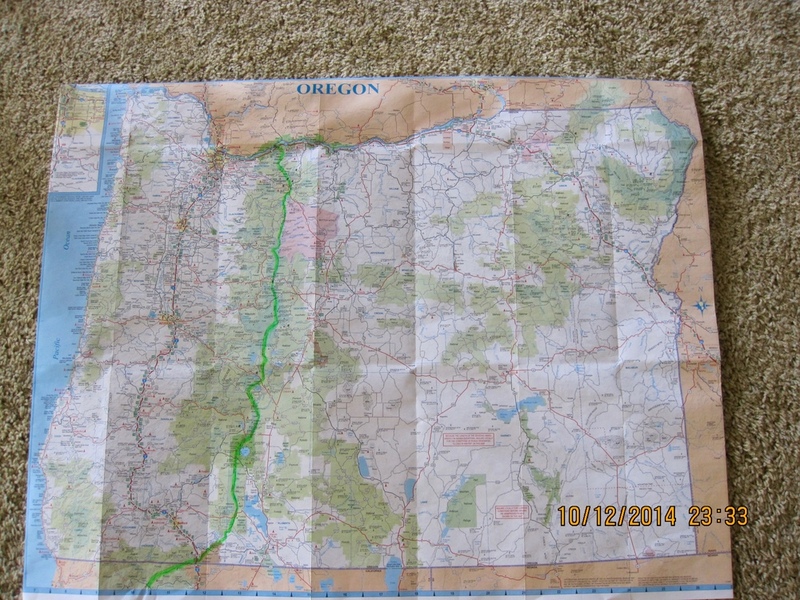 Our hike of Oregon was over and our appetite for doing more of the PCT is contagious. Next year Washington!